It will be presented on September 1 at the APSA Annual Meeting. 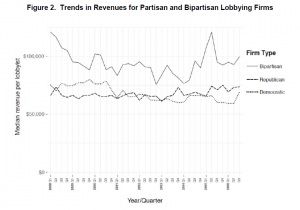 Among other things, we find that Republican lobbying firms experienced a bump in revenues when the Republicans took control of the House in 2010, but not when they captured the Senate in 2014. 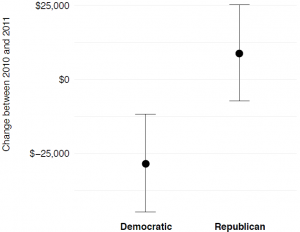 Republican lobbying firms secured a nice bump in revenues after Republicans captured the House in 2010, but NOT after they captured the Senate in 2014. From my joint work with Zander Furnas and Tim LaPira, to be presented at this year’s APSA Annual Meeting. 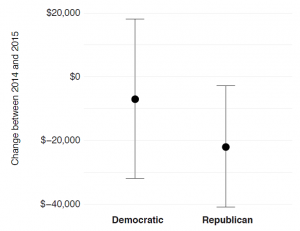 Protest Fatigue: Have Weeks of Protests Made an Impact? Check out my essay “The March for Science and Democracy in America”, at “Learn, Speak, Act”, a new blog sponsored by the College of Literature, Science, and the Arts at the University of Michigan. Thank you to Nicholas Valentino for helpful feedback. Thank you to Katarina Nehrkorn, Will Sollish, Kiki Bayen, Yuka Naya, Aubrey O’Neal, Michael Mrozinski, and others for survey assistance. Thank you to Betsy Mendelsohn, Robert Bateman, and Kate Bateman for providing housing and meeting facilities.